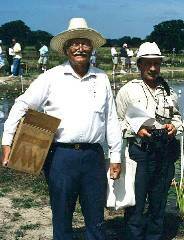 NOTE: In the summer of 2001, I was asked to write an article on water lily hybridization pioneer Dr. Kirk Strawn. Helen Nash was going to do a series of articles in her magazine, Helen Nash's Pond & Garden, about the living legends of water lily hybridization. I was asked to do the feature on Kirk. The schedule was that the articles would be in her November/December 2001 issue. 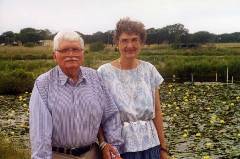 During August of 2001, I went to College Station, Texas, and had the pleasure of visiting with Kirk and Charlene Strawn in the office of Strawn Water Gardens. Previously, I had talked with Charlene a couple of times on the telephone. She was gracious enough to send me some previously printed articles about Kirk, along with some exciting pictures, to help put this article together. Sadly, a few weeks after the interview, the horrifying events of 9-11 occurred. As a result of tightening economics, Helen's magazine was unfortunately not able to survive. One of the most prolific writers in the water gardening world had to put down her pen. Kit Knotts asked me to go ahead and complete my project for inclusion on Victoria-Adventure. With great excitement, I went ahead and finally finished it. 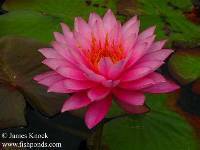 Dr. Kirk Strawn is, without question, one of the premier hybridizers of hardy water lilies of all time. His introductions have established a new benchmark for color, shape and performance that will be difficult to surpass. Though Kirk is a Florida native, most of Kirk's professional career was spent in Texas and Arkansas. Charlene is a Texan, raised in Dallas. In college, Kirk was headed to the world of medicine. He was finishing pre-med school and had been accepted into medical school. It was at that juncture that he decided to pursue biology instead of medicine, and joined the Navy SeaBees during World War II. He had been an entomology major at the University of Florida when he left school for the military. Following his discharge from the Navy, Kirk and Charlene got married and both finished their studies at the University of Florida. Biology and fish were his first professional love. And teaching eager students. He first began teaching at Southwestern University in Georgetown, Texas. He then taught for three years in the biology department at Lamar University in Beaumont, Texas. After Lamar, he did research for a year at the fish hatchery at Texas A&M University. He then taught for six years at the University of Arkansas. He returned to Texas A&M, where he finished his teaching career in their Wildlife and Fisheries Sciences Department. While Kirk taught at the University of Arkansas in the early 1970's, the Strawns lived in Fayetteville. Charlene decided that she wanted to grow water lilies, and had two whiskey barrel water gardens in their front yard. From that humble beginning, the legend began. When the Strawns moved back to College Station in the mid-1970's, Charlene decided that she wanted to get serious about water gardens. She had a pond dug in their new backyard. The soil consistency in College Station was perfect for natural ponds, and Kirk began to get interested in his wife's favorite hobby. Helping decide what plants to put in her new pond, he realized that the natural soil was the ideal medium for water lilies. He quickly became hooked himself, as one pond after another appeared in their yard. We have a saying in Texas that "Everything is bigger in Texas." This was certainly true with the extent of the Strawn's water gardening. Kirk decided that he had to have every single water lily that was available. That's right - one of EVERYTHING. As a result of his collecting, he began to notice that there were many plants that were being sold with inaccurate names. The same name might be used for various plants that didn't have anything in common with each other. Kirk was determined that he would get accurate descriptions and names. That determination helped influence today's breeders and sellers to be more careful about the plants that they introduce to the market. 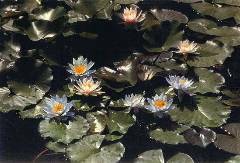 Kirk started collecting water lilies from growers all over the United States, England, France, Germany, Australia, and New Zealand. In the middle part of the twentieth century, though new tropical water lilies were being developed by William Tricker, George Pring and others, Kirk noticed that few new hardy lilies were being introduced. If you wanted a hardy, there was a list, basically the same year after year after year, and most plants on that list had been hybridized by Joseph Bory Latour-Marliac in southern France. In the late 1800's and early 1900's, Latour-Marliac was the most influential grower of water lilies in the world. He even provided the water lilies for Claude Monet's garden in Giverny, France. Those would become the most famous lilies in the world as Monet painted the masterpieces of his ponds. When Latour-Marliac died in 1911, his recipe for success was kept secret by his successors. Others attempting to hybridize using his plants as parents met with failure. Through experimentation, Kirk discovered that by ignoring the plants of Latour-Marliac and concentrating on the species and older garden varieties, he was able to create new hardy hybrids. Latour-Marliac's secret, Kirk discovered, was amazingly simple - he had introduced only infertile plants to the market. His goal was that none of his water lily hybrids would ever produce viable seed. Why did Latour-Marliac only introduce infertile plants? Interestingly, this has two possible answers. The first one was that Latour-Marliac did it to make it more difficult for competitors to use his plants to create their own lilies. But it was also hypothesized that Latour-Marliac did it to keep his plants pure. His plants were going to the homes of the wealthiest people of his time. As such, Latour-Marliac might have wanted to be sure that his customers always had the best water lilies. He might have been concerned that random pollination by insects could create inferior water lilies. The true answer was confirmed many years later when Latour-Marliac's estate and papers were purchased. The documents revealed that Latour-Marliac did, indeed, introduce sterile plants in order to control the market. Pollination by insects very rarely results in a significant plant, but Kirk had this very thing happen to him. One lily defied the odds and he thought it was good enough to keep. Thus, N. Charlene Strawn came onto the market! This was the first plant that he introduced. It is very appropriate, since it was Charlene who got him involved with this hobby in the first place. At this point, Kirk started hybridizing water lilies in earnest. He also hybridized Louisiana Irises. When he retired from Texas A&M University in 1991, he worked full time with Strawn Water Gardens. He became a worldwide supplier of excellent water lilies, many of which he created. 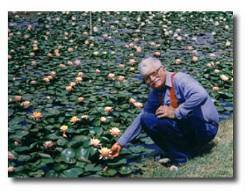 He hybridized more than 50 named water lilies and the same number of Louisiana Irises. Strawn Water Gardens carried over 100 water lily varieties, over 70 Louisiana Iris varieties, and numerous other bog plants. Several "conspirators" worked with Kirk to manufacture a hardy waterlily that was blue. It was and is every hardy waterlily hybridizer's dream to produce the first true blue hardy. Naturally, Kirk and Perry Slocum endeavored to fulfill this dream. At any rate, the conspirators decided to bait Perry with the rumor that Kirk had secretly produced the much-desired blue hardy. Not only that, but it could be found growing unmarked at the extreme far end of Kirk's ponds. As soon as Perry set foot off the bus, he headed straight for the far-away ponds with photo equipment in hand. The conspirators were smiling broadly. Finally, Perry spotted the blue hardy. Yes, there it was, a real live blue-colored waterlily blossom. Poor Perry, only after taking all his pictures it was revealed that Kirk hadn't been any more successful than Perry. The hardy's blue color came from an elaborate dye job by the conspirators. When Kirk Strawn first became interested in water lilies, there were around 70 named hardy lilies available. Today, there are many, many more, and among the finest of these are the Strawn cultivars. He has expanded our knowledge of hybridization but others who follow in his footsteps will be hard pressed to emulate his success. SOURCES: Texas Gardener (May/June 1987), The Garden (April 1993), Water Gardening Magazine (May/June 1996), Country Life (May 1996), The Advocate (February 2001), telephone conversations with Charlene Strawn (June/July 2001),.interview with Dr. Kirk & Charlene Strawn (August 2001), interview with John Loggins of Lone Star Aquatics (July 2005), reviewed by Bob Strawn (October 2005).